wake, apparently. 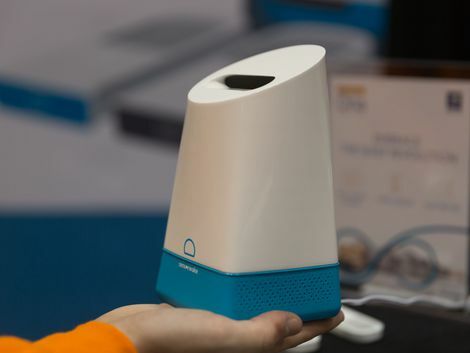 Oria, its new $150 bedside device (roughly converted to £122 or AU $207) going on sale in summer 2017, patented scents around users' rooms to help them fall asleep faster, and sleep more deeply than ever before. Whether it actually accomplishes that purpose remains to be seen. For now, Oria is a pretty one-dimensional product. It is connected to Wi-Fi, so integration with other platforms is a possibility for the future, but nothing is concrete yet. But it is special in one way: It holds a receptacle for recyclable scent capsules (each lasting about two months with daily use), and a fan for dispersing their aromatic contents around the immediate vicinity of the user. 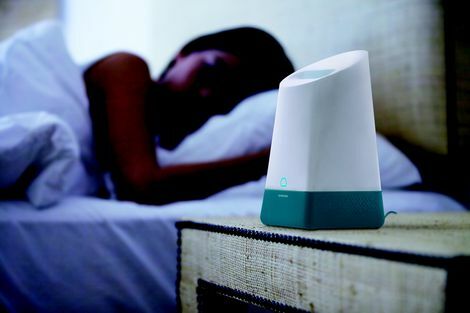 Tyler Lizenby/CNET Sensorwake's two patented scents are designed specifically to help users get to sleep faster, and stay in deep sleep more consistently. The company's in-house specialists and business partners cite their own research indicating Oria gets users 40% better sleep. Without third-party corroboration, however, it's impossible to gauge how beneficial the device will actually be. Even Sensorwake acknowledges aroma is inextricably linked to memory, making it practically impossible to design a device of this sort with broad appeal. Its detailed descriptions of its scents ("powdered rose, peach and pear, with notes of talc and musk") certainly sound appealing, but not necessarily effective for all users. Despite my skepticism, though, Oria will likely work at least on an atmospheric level -- much like scented candles and incense. The only problem is, most candles and incenses don't cost $150.